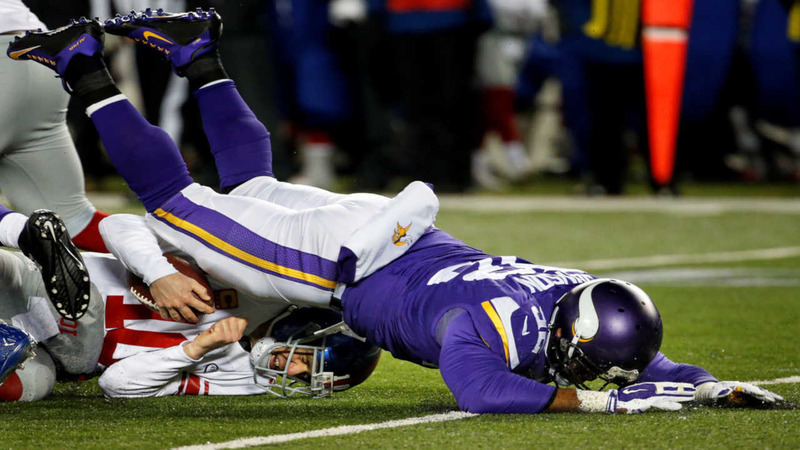 MINNESOTA -- Adrian Peterson ran for 104 yards and a touchdown over three quarters, Harrison Smith took one of Eli Manning's three interceptions into the end zone and the Minnesota Vikings clinched a playoff spot with a 49-17 victory over the New York Giants on a frigid Sunday night. Teddy Bridgewater turned in another sharp December performance, Blair Walsh chipped in five field goals and the Vikings (10-5) set up an NFC North championship game next week at Green Bay. With Peterson relaxing on the sideline, Jerick McKinnon rushed for two more touchdowns in the fourth quarter, including a 68-yard romp through a disinterested defense with the temperature down to 11 degrees. Manning badly missed suspended wide receiver Odell Beckham Jr. and his 1,396 yards and 13 touchdowns, as the Giants (6-9) trudged toward a fourth straight absence from the postseason.